According to a recent study 2 in 3 community college students are food insecure; meaning they have a limited availability of nutritionally adequate food. With over 40 percent of Northwest Vista College students on Pell grants, NVC plans to address this issue by creating its very own food pantry out. The pantry will have a soft opening in July and should be fully functional by the fall semester. NVC will partner with the San Antonio Food Bank to receive training to help with the initial startup. Through the Vista Hunger Relief drive and some funding from the college, food will be purchased from the San Antonio Food Bank. 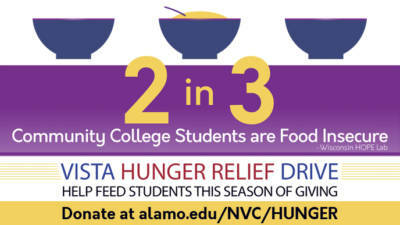 San Antonio College purchased around 35,000 pounds of food from the Food Bank last year. The food pantry will be able to store both fresh produce and a variety of other foods. There will also be a series of food drives, as well a new fund started as part of the NVC Employee Giving Campaign to help keep the pantry stocked with food. According to the San Antonio Food Bank, Texas itself is ranked second in the nation for food insecurity with 1 in 6 living in food insecure homes. Additionally, since San Antonio College started its food pantry about a year ago, it has had a little more than 600 students utilize it. Students are allowed to get food essentials twice a month, and often they have lines of students at the end of the month stocking up on food.